What more could you ask for? A grown man in a children’s book inspired wolf suit shredding deep ‘crete? Well that’s exactly what you are getting. 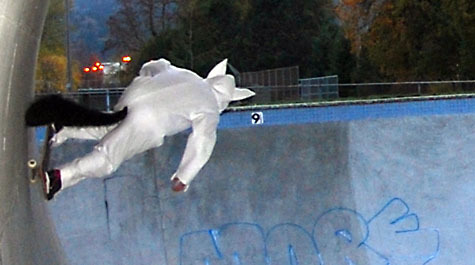 Check out MC as he takes his distinctive wolf suit for a spin at Pier Park after the turn…. A different kind of boned air over the mouse hole. Note MC’s tail. We are guessing that this is the first ever Andrecht in a wolf suit. We could be wrong. Another Andrecht on re-entry with tail in full bloom. That suit is rad. The funniest thing about this session is that it is post-Halloween. Taking a page from the Grover songbook. I’d wear that outfit everyday if I could get away with it. That don’t make me a furry or nuthin’ does it? man you guys really touch each other after the session dont ya? Furries are some of the creepiest people ever way to go MC!!!!! Geez, I thought I had a forest going in my buttcrack.